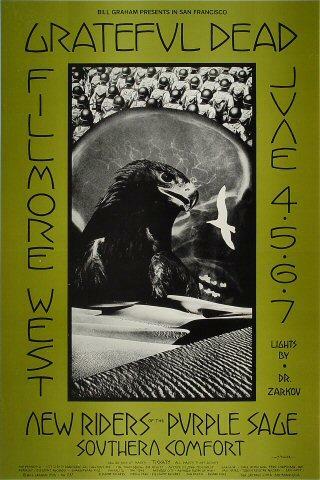 The Grateful Dead appeared at the Fillmore West with New Riders of the Purple Sage, a Dead spin-off band, and Southern Comfort, a short-lived rock quintet. This was the last of four posters that David Singer drew for the Dead. This poster was only printed once before the concert. It displays a significant amount of ink variation throughout the run, noticeable in the darker to lighter shades of background green and black to brown inking. It measures 14" x 21".